One of the greatest challenges for many elementary kids is mastering the times tables. 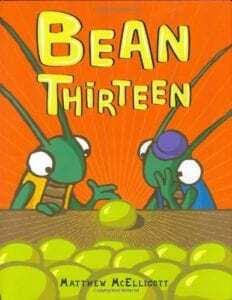 And while there are tons of ways to make it fun, one of the best ways is to engage kids with math stories. Using books to introduce or teach multiplication concepts can help ease kids fears, as well as show them math in real life situations. And once they master the facts? Learning and understanding division is not quite so scary! 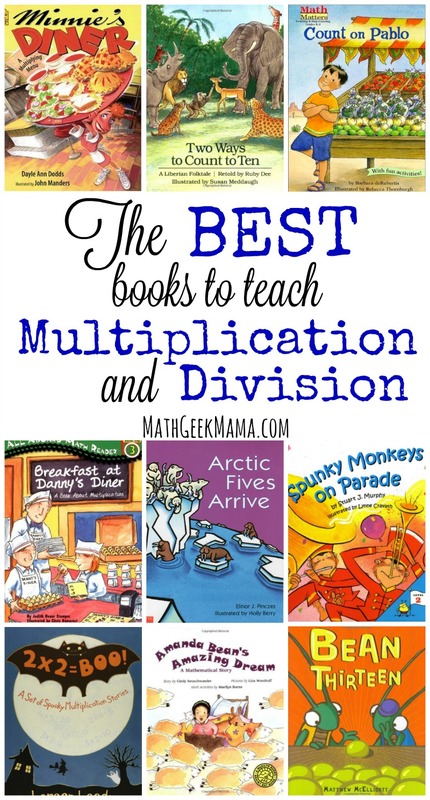 So I’m excited to continue my series on teaching with math story books by sharing a massive list of books to teach multiplication and division. There are lots of benefits to incorporating math story books into your curriculum. But knowing how to use them or what books to choose can be a challenge! I’m hoping that by doing lots of reading and research for you this summer, I can provide a great starting point. 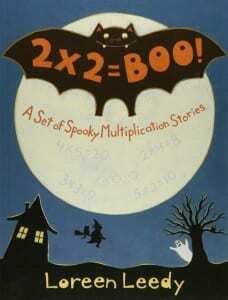 2×2=Boo! (tier 1) by Loreen Leedy is a fun collection of Halloween themed stories to teach the multiplication facts for 0-5. The focus of these stories is on groups of equal parts. Two of Everything (tier 3) by Lily Hong is a really cute folktale in which a magical pot doubles whatever is put in it. This could be a fun introduction or a good way to work on the 2’s facts. 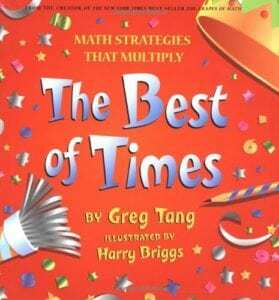 The Best of Times (tier 1) by Greg Tang is a fantastic book! The fun rhymes can help with memorizing the facts, but also include helpful strategies for solving the facts from 0-10. 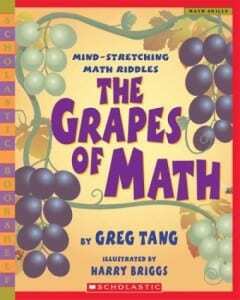 The Grapes of Math (tier 1) by Greg Tang is another classic. This does not teach multiplication, but includes fun counting challenges. This would be a great way to put those multiplication (and skip counting) skills to work! 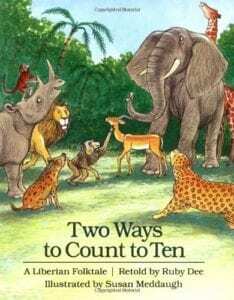 Two Ways to Count to Ten (tier 3) by Ruby Dee is another cute folktale. While this doesn’t teach multiplication, it does show that skip counting (or multiplication) can be beneficial, and faster than counting by 1’s. 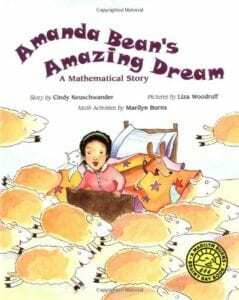 Amanda Bean’s Amazing Dream (tier 2) by Cindy Neuschwander is another fun book that will help kids see the importance of multiplication. The focus of this book is on repeated addition (and why multiplication is a “faster way to count”). The pictures also includes lots of examples of arrays. There are also activity ideas included in the back of the book. 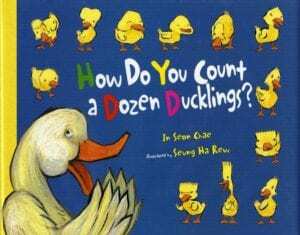 How Do You Count a Dozen Ducklings (tier 2) by Seon Chae is a cute tale of a mother duck and her many ducklings. The book shows all the different ways to make 12, and also demonstrates the commutative property. 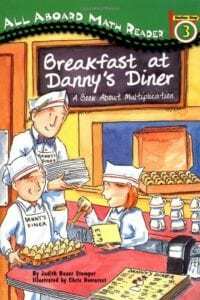 Breakfast at Danny’s Diner (tier 2) by Judith Stamper is a fun early reader that gives kids a glimpse at multiplication in real life. It also includes examples of doubling a recipe. 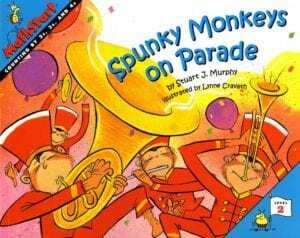 Spunky Monkeys On Parade (tier 2) by Stuart Murphy includes fun rhymes and silly pictures and focuses on skip counting by 2’s, 3’s and 4’s. Arctic Fives Arrive (tier 2) by Elinor Pinczes is such a great book! 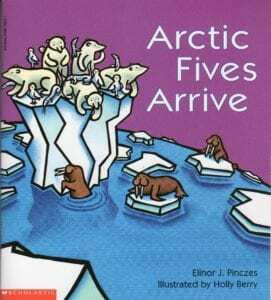 The adorable rhyme tells the tale of arctic animals arriving 5 at a time for a special event. Not only does it teach counting by 5’s, but is a fun way to learn about arctic animals. 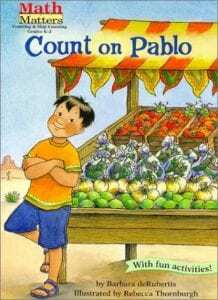 Count on Pablo (tier 2) by Barbara deRubertis is another fun early reader that shows kids skip counting in real life. 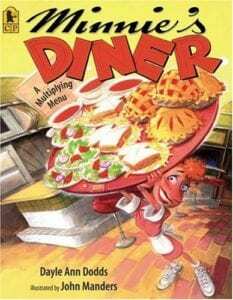 Minnie’s Diner (tier 2) by Dayle Ann Dodds is a funny tale, with pictures that kids will love. 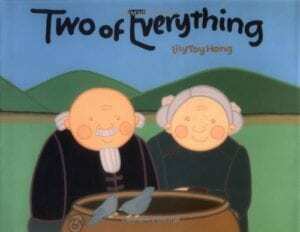 This book focuses on multiplying by 2. Now…for My Next Number! (tier 1) by Margaret Park is similar to The Best of Times. Unique and silly rhymes are told for each of the multiplication facts. 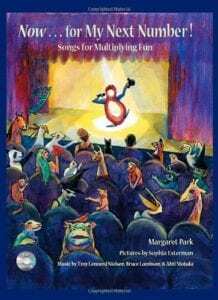 This book also includes a cd, so kids can sing the songs to help them learn. 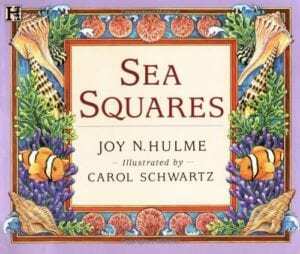 Sea Squares (tier 1) by Joy Hulme is a cute little book that teaches squaring numbers from 1-10 using fun rhymes and delightful pictures. You could even use this as you start a discussion of square roots with older kids. 7×9 = Trouble! (tier 2) by Claudia Mills is a more advanced chapter book, which includes some tips for learning multiplication, but also shares a boy’s anxiety and feelings about learning the facts and passing his tests. 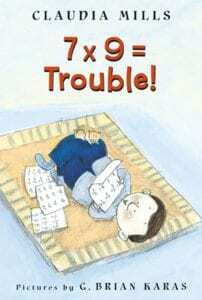 If you have a child who is math anxious, or frustrated with learning the times tables, they may appreciate this story! Math Attack! 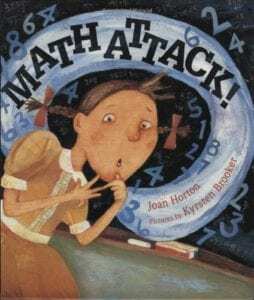 (tier 2) by Joan Horton is similar to 7×9=Trouble, but for younger kids. 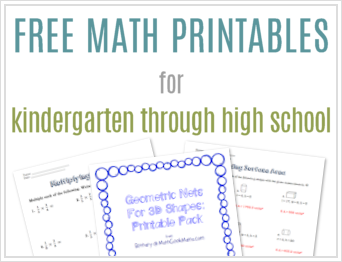 This is a great way to encourage math anxious kids! 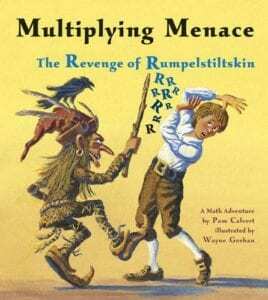 Multiplying Menace: The Revenge of Rumpelstiltskin (tier 2) by Pam Calvert is a unique twist on the classic tale of Rumpelstiltskin! 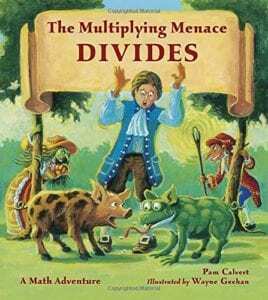 The Multiplying Menace Divides (tier 2) by Pam Calvert is a great follow up to Multiplying Menace, but this time helps kids tackle division! 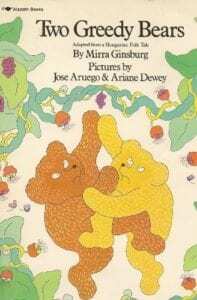 Two Greedy Bears (tier 3) by Mirra Ginsburg would make a fun introduction to division. This would especially be a fun story to read to younger ones to get them thinking about the concept of division before they begin to learn it formally. 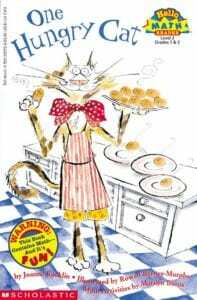 One Hungry Cat (tier 2) by Joanne Rocklin is another book that would be a great way to introduce division to younger kids. Kids will likely be familiar with sharing equally, and will be able to relate. 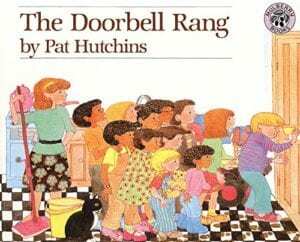 The Doorbell Rang (tier 2) by Pat Hutchins is another great book for introducing division as sharing equally. It covers divisions of twelve. 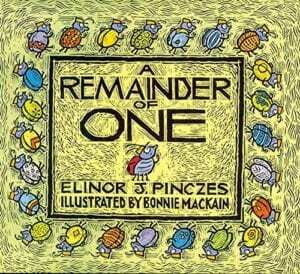 A Remainder of One (tier 2) is another great math tale from Elinor Pinczes! This time the focus is on dividing 25 and understanding the concept of remainder. 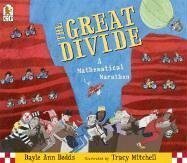 The Great Divide (tier 2) by Dayle Ann Dodds is the story of a fun race which shows how to divide by 2. The pictures are fun in this one too! 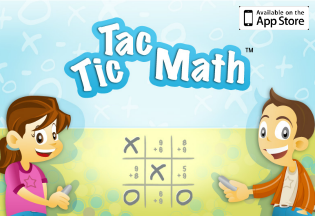 Looking for ready to go lessons to teach multiplication in a fun, hands on way? 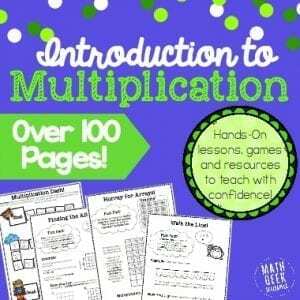 You may be interested in my Introduction to Multiplication Lesson Bundle! Click here or the graphic below to learn more. 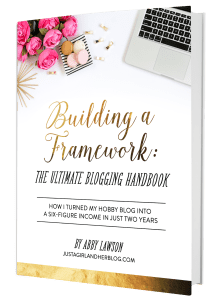 Thank you for this wonderful list as well as the comments for each book! My second child (going into 4th) struggles with basic math concepts. This past year, she panicked over each multiplication and/or division lesson. It all began when her math book switched from multiplication to division – and she didn’t understand the difference. Since then, I have to sit next to her every day, walk her through a few problems with manipulatives, and then stay near by while she worked the rest of the assignment alone. Even though she finished the assignment with no mistakes, she would be panicked the next day. All semester long. She particularly struggles with remember what is “multiply” and what is “division.” 10 / 5 = ?? She will painstakingly draw five boxes, fill each with ten dots, and then write the answer 50. When I explain the answer is incorrect and why, she insists that it must be correct because of her picture. Sigh. Any suggestions for helping her learn the difference between the symbols would be appreciated! I’m praying a lot of practice, over and over, will help! Oh wow, thanks for sharing that struggle! I would say first of all, continue to take things slow, and try to keep it fun and low-key. You definitely don’t want to add to her math anxiety. In terms of remembering the difference between the symbols, maybe doing a vocabulary sort would help? Write out all the words you can think of that represent multiplication and division on strips of paper (or post it notes). Then write a multiplication symbol and division symbol on two pieces of paper and have her sort the words that represent each operation. Maybe the repetition of all the different words associated with the correct symbols will help cement the difference in her mind. I hope that helps!